The Engraved Mother's Neckalce with 1 Birthstone Charm in Sterling Silver is a popular choice for Mother's Day, birthdays, anniversaries, and other special occasions. Remember the special one in your life with a personalized pendant that you can design. 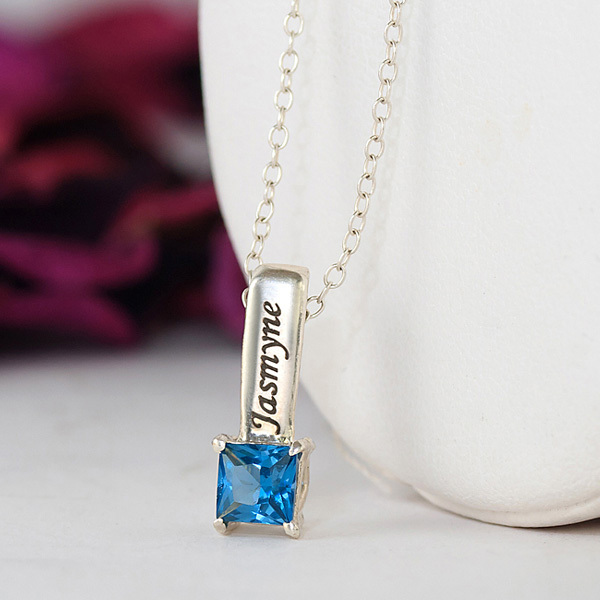 Select one name, up to ten characters long, and a birthstone that will be set into the silver pendant. The pendant features a built in loop at the top for easy wear and care-free use. This is a wonderful gift for any special occasion or as a simple way to say "I love you." Create something that is truly unique and that will be remembered and treasured for a life time! We guarantee our Engraved Mother's Necklace with 1 Birthstone Charm in Sterling Silver to be high quality, authentic jewelry, as described above.